Also known as dulce de leche, this dessert is divine. 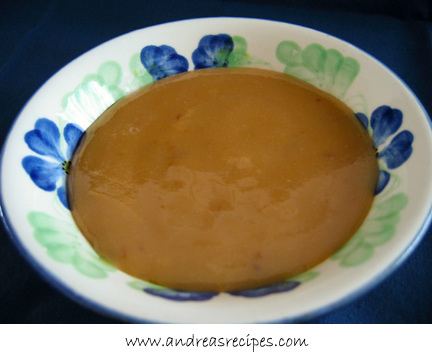 It’s thick and creamy and has a wonderful caramel flavor. 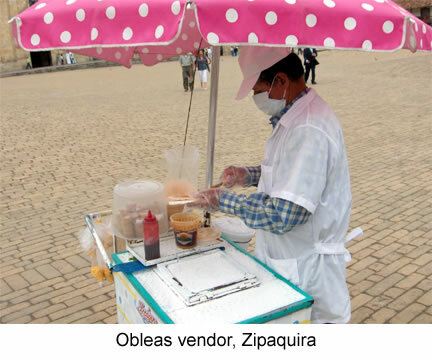 Vendors on the streets of Colombia sell it along with a type of wafer known as obleas, which basically looks like an unrolled waffle cone. You smear the arequipe on the obleas and eat open faced or put two obleas together like an arequipe sandwich. You can also dip fruit and cookies into arequipe, or warm it up and drizzle it over ice cream, bananas foster, or hot apple crisp. The grocery stores in Colombia sell it in tubs of various sizes, including single servings which my students would bring in their lunches. This is one of those dishes that you have to watch carefully while it’s cooking. It can go from almost done to burned in a nanosecond, so don’t be tempted to wander off. You don’t need to hover, just keep an eye on it. This will take a little over two hours to make, so plan your day accordingly. It’s a fun weekend project, though. And for people like me who have no Colombian grocery nearby, this is the only way to get arequipe without paying exorbitant shipping prices. 1. Dissolve the baking soda and cornstarch in 1/4 cup (~60 mil) of milk, then combine all of the milk and sugar in the pot. 2. Cook, stirring frequently, over medium heat until the sugar dissolves, and then bring it to a slow boil. Watch it closely. The color will gradually change from milky white to golden brown and the consistency will thicken. Continue cooking until the mixture coats the spoon and begins to set up as it cools on the spoon, about 2 hours. Finished temperature should be 220° F/104° C. It will look runny in the pot, but will thicken nicely as it comes to room temperature. 3. Pour into a bowl. Don’t scrape the pot or you’ll have crunchy bits in the arequipe. Allow to cool, and then serve. Store in the refrigerator. The original recipe calls for 8 botellas de leche y 5 libras de azucar (8 bottles of milk and 5 pounds of sugar). That’s a lot of arequipe! So I reduced the recipe substantially to get an amount that would be more manageable. Even so, this recipe makes enough for a party, about 24 ounces, so consider cutting in half for a smaller amount (adjust cooking time accordingly). – De casualidad tu tienes la receta de las cocadas de arequipe que en Colombia conocemos con la marca Copelia, si la tienes me la puedes regalar cuando tengas tiempo. Fue agadable encontrar una tu receta. I was so excited when I found this recipe on your site. My mom used to make us arequipe when I was young by boiling a can of sweet condensed milk. I have always wanted to make it from scratch and it was even better than i remember! Katie, I’m glad you enjoyed the arequipe! Thanks for the recipe! I’m wondering if you know how to make the white cream used in between obleas? I recently was in Cali and there they do a layer of arequipe and a layer of white cream (crema de leche is what I was told there). What would that equate to in the States? Andrea quisiera saber si sabes como hacer unos bocadillos de arequipe los vi que los hacen en Velez . Que chevere encontrar esta receta! Mis 3 hijas se “mueren” cuando les compro arequipe, que no es muy amenudo! Queria saber si tienes una receta para preparar mantecada. Me acuerdo comerla las tajadas en Colombia ya hace mas de 22 anos, y estoy loca por buscar la receta. Andrea, Muchas Gracias por mostrar un poquito de mi cultura y mi pais. Disfruto mucho cuando veo que personas como tu muestran algo de mi herencia. Buenos dias te estoy molestando por lo siguiente desearia poder encontrar los ingredientes para poder preparar las obleas por favor si la sabes me gustaria que me ayudaras con eso. tambien las salsas que le echan encima aparte de el arequipe que esta delicioso entre otras cosas . My son is participating in a Cultural Fair at his school. We are looking for a few traditional recipes/foods that are native to Columbia. We are going to make Arequipe and a quick bread with corn with our friend from Columbia. We are looking for something that he can share as small samples- do you have any other suggestions? By the way-he is six but cooks with me quite a bit. Any help would be great! Muy buenas tarde Andrea, viendo tus recetas analizo que eres una dura en la cocina, sabes demaciado, eso es algo muy lindo. Andrea soy Colombiano y estudiante de tecnologia agroindustrial, ya terminamos en este semestre, me encuentro haciendo la tesis para poderme graduar en este mes de agosto próximo de 2009, mi tesis es estandarización del arequipe en Vegachí. mi pregunta para ti es cual es el rendimiento o sea cuanto disminuye el arequipe al llegar al punto. mas claro 2 litros de leche, 2 ó 1½ kilo de azúcar, y vicarbonato, en cuanto queda este arequipe o cuanto queda pesando? te agradezco que me ayudes con esto. AMO el arequipe y tu receta esta excelente pero lastimosamente no soy muy buena cocinera y no me quedo como esperaba; asi que estuve haciendo mis investigaciones y me tope con la pagina de Alpina en U.S. (WWW.ALPINAUS.COM) y me di cuenta que ya estan distribuyendo sus productos en Estados Unidos pero solamente en Florida y en New york, pero lo mejor de todo es que si uno no vieve en niguno de esos dos estados ellos tienen una pagina de Amazon donde los envian a cualquier parte de los Estados Unidos. Asi que para los que fracasaron en su intento de hacer arequipe como yo, pueden pedir el arequipe por Amazon. I just found your blog looking for an arequipe recipe and to my surprise i found one of my blog friends, Erica from My Colombian Recipes. I think your blog is beautiful and would like to subscribe to it. prepare el arequipe y me quedo delicioso pero al dia siguiente se sentia el azucar como granuloso. Que crees que hice mal?? Graias y te felicito por tu blog! Hi Bessie. Sorry, my Spanish is not as good as it used to be. 🙂 Was there any grainy sugar crystals around the top of the pan when you finished cooking? If so, those might have been scraped into the arequipe when you transferred it to a container. Or perhaps was the arequipe exposed to air for a long time after it cooked? That can also cause graininess. Hola Andres. Se cocina en aproximadamente dos horas. I was wondering, do you know where I could find an oblea machine/maker/cooker? Thanks! Hi Anrdrea,thank you for your recipe! Hi Elizabeth. I admit oblea makers aren’t easy to find in many places. You can try making them in a crepe pan. You will have to turn them, but it should come pretty close. Let me know if you try it!